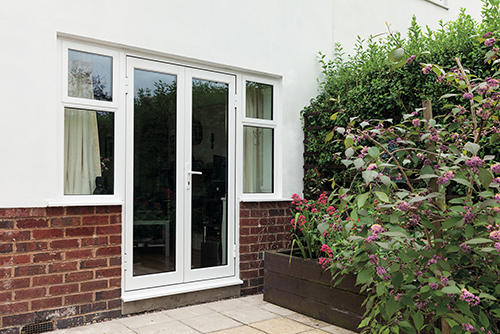 The Crown Residential door has been a staple of the Sapa product range for many years. Replicating the square cut aesthetics of traditional wooden back doors, but with the strength and longevity of aluminium. The new door is based on a three chamber construction, for greater strength and performance. With symmetrically designed door and framing, the new Crown Residential Door has simplicity of fabrication and installation at its heart. Building upon the ease of manufacture, the new Crown Residential door boasts a unique adjustable hinge arrangement which allows for full adjustment of the door during installation to ensure correct alignment of door and frame. To enhance the handing flexibility of the door further, a universal locking strike plate is now provided with a 24mm or 28mm pocket to glaze from inside or out using sloped or square beads. The door is secured as standard by a three hook lock supplemented by a security dog bolt within the hinges. It is also available with the Sapa patented ‘Dualsecure’ deadlock which not only provides exceptional levels of security but also makes the door certified to PAS 24. The New Crown Residential door is available as a boxed kit of cut off machined bars and accessories. Made to order kits are cut and prepped to your requirements only requiring assembly.